Note: Even though this is Book 6 in the series, it works fine as a stand alone. Kay Hunter has her hands full with this one! It all starts with a group of bicyclists and a detached foot. The trail of clues lead to resort hotel that has lots of team building activities like archery, barbecues, and such. So many suspects, so little time before yet another victim turns up dead. First, I have to talk about the goat. Kay’s husband Adam is a vet and he sometimes has to bring home a critter for a little TLC. This time, it’s a little goat. Adam thinks he can set up a pen in their back garden for the little devil. Hahahahahahaha! Obviously, Adam has a lot to learn about goats. I found this an adorable touch to what is admittedly a grim story. Back to the grim story. I did find one thing kind of weird. Everyone who comes into contact with a dead body or body parts (except for Kay and her boss) has a strong emotional reaction. The bicyclist who found the foot vomits and cries and has to be seen to. The truck (or was it a tractor?) operator who finds victim #2 is so distraught he gets the rest of the week off. Now these guys don’t know the deceased at all, so I thought it was a little odd to have the same emotional reaction from two guys. Later on, two of the junior detectives also have a strong reaction but they fare better in hiding it. I expected a greater variety in reactions and not for nearly everyone to be upset over it. Other than that, this was an intriguing murder mystery. I loved the tangled web at the resort. Since there’s all these capable people hired by the resort to provide activities for the guests, there’s plenty of surprises to uncover. I enjoyed the little snippets about the various arts and crafts. This is Kay’s first big investigation where she’s leading things and her boss is right there offering a helping hand (because he’s a good guy). Her team is also well oiled, each one knowing how the other operates. They’ve been having their own unofficial team building dinners once a month and it shows! I love that there’s no in fighting or sneaky, petty behavior. Perhaps half way through the book, they figure out how the killer is disposing of the bodies (mostly) but they still don’t have a motive or a list of solid suspects. It’s a pretty gruesome disposal method but I personally think the worst is left to be revealed at the end of the book. The tension is a slow, delicious build for this mystery. Kay’s team has to work hard for each little crumb of a clue. Once they figure out the motive, the who is pretty easy to figure out. Then it’s just hunting the killer down before the body count grows again. This was an intense ending to the book and not everything turns up roses for everyone. Another great addition to the series! 4.75/5 stars. 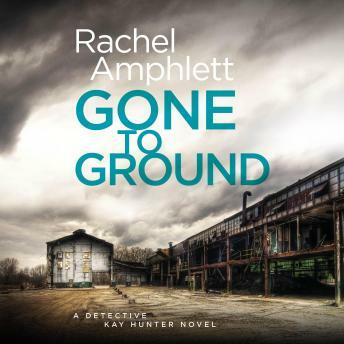 The Narration: Alison Campbell continues to be a great Kay Hunter. I also like her supportive, sometimes teasing voice for Adam. She makes a great Kariss (one of the junior detectives) as well. Sometimes her male voices drifted into feminine tones especially if the male character was speaking gently or quietly. But much of the time, the male voices were masculine. Each character voice was distinct. The pacing was perfect and there were no technical issues with the recording. 4.5/5 stars. I received this audiobook as part of my participation in a blog tour with Audiobookworm Promotions. The tour is being sponsored by Rachel Amphlett. The gifting of this audiobook did not affect my opinion of it.